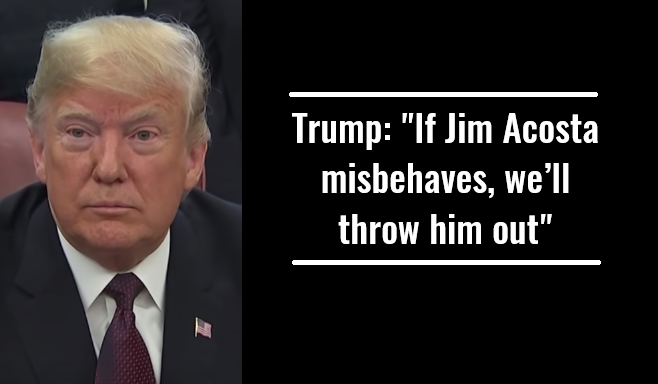 Trump: "If Jim Acosta misbehaves, we’ll throw him out"
CNN’s Jim Acosta’s “hard pass,” was suspended last week after he once again acted up during a press conference. Acosta refused to pass the microphone to a female White House aide. CNN backed by Fox News filed a federal lawsuit against President Trump’s administration on Tuesday demanding that the White House restore the press credential of the attention seeking reporter. Speaking to Fox News’ Chris Wallace, President Trump issued a warning to CNN’s Jim Acosta. President Trump said that if CNN White House reporter Jim Acosta “misbehaves” going forward after a federal judge temporarily restored his press pass, he will kick him out of press conferences. Trump sat down with the Wallace on Friday for a wide-ranging discussion. The “Fox News Sunday” host pointed out that a federal judge ruled earlier Friday that the White House must reinstate Acosta’s press credential. Wallace asked what rules the administration would put in place going forward after U.S. District Judge Timothy J. Kelly declared that Acosta should be allowed back in the White House. “We’re writing them now. We’ll have rules of decorum, we know you can’t keep asking questions. We had a lot of reporters in that room, many many reporters in that room and they were unable to ask questions because this guy gets up and starts, you know, doing what he’s supposed to be doing for him and for CNN and you know just shouting out questions and making statements, too,” Trump said. The Judge’s decision is temporary and further hearings are expected in the next few weeks to determine whether or not revoking the credential violated CNN’s and Jim Acosta’s First and Fifth Amendment rights. The temporary order only lasts for 14 days and CNN can petition the Court for a permanent injunction.